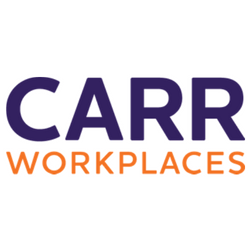 Carr Workplaces cutting edge state-of-the-art fully furnished office space is located only 1,600 steps from the U.S. Capitol in downtown Washington, DC. (To get any closer you will need to be elected!). Our building features a dramatic grand entrance with ten story atrium and unparalleled rooftop terrace views. We provide beautifully appointed co-working options, private day offices and meeting room spaces in a five-star setting. Our team of service professionals stand ready to provide you with excellent service. Booking a place to work at our location includes access a phone to include local and domestic long distance calling, the internet, self serve gourmet coffee, tea and filtered water. You work, we do the rest! Capitol Hill has it all: a prestigious location, first-class service on demand, and an incredible unobstructed view of the Capitol building and Union Station. This beautiful brand new building is the place to be in D.C.